Is your B2B content marketing a complete waste of time? It's a truth universally acknowledged: some people just shouldn't be allowed to choose their own clothes, others shouldn't be allowed behind the wheel of a car, and still others shouldn't be put in charge of mixing a decent cocktail. Horses for courses, as the saying goes. Yet many businesses get wrong- footed every day by trying to “do” B2B content marketing when they are simply not geared up for it. Like a rookie barman seasoning a Bloody Mary, the end product is likely either to be bland, repellent or simply left untouched. You may think you'd never hear me say this, but some businesses should seriously consider whether they're not wasting their time doing B2B content marketing at all. Here's some characteristics that the quadrupeds in question may exhibit. It's a harsh fact to admit, but if yours is the kind of organisation where the CEO doesn't buy into Marketing's ideas, just don't bother with the content stuff – it's an almost total waste of your (and the business's) time. As the Content Marketing Institute (CMI) reveals, organisations without C-level buy-in are three times more likely to fail at content marketing. Those are not good odds, on any horse. Want to make the move from marketing underinfluencer to marketing overachiever? Getting senior types on side is absolutely critical. They need to care about B2B content marketing the same way you do. Take a leaf out of Adria Saracino's blog and learn how to “pitch it right.” It's never going to be an easy exchange, but if you want to hit the gallop, you've got to be prepared to dig in your heels. So how can businesses move out of leaden and into lightspeed? Well, agile is as agile does – so consider adopting a project management philosophy for your content writing (and, in fact, across your entire marketing mix) that does what it says on the tin. Sprint, scrum, and fall off early rather than getting thrown off later on. If it works for some of the world's most complex software engineering projects, it can work for your content, too. Now take a look at your business. Does it have a mechanism for recording customers' feedback and using this to improve the next generation of marketing collateral? Does it practise “social listening” to help drive its content marketing? Does it base its content marketing plan on the themes and “hot topics” that are clearly of interest to its customers (which, as I have paraphrased elsewhere, is the only way you're ever going to get their attention)? If the answer to these things is no, your business's content is likely to garner about as much attention as the horsey man with the tweed cap and shouty megaphone at the village fete. Content marketing goes back at least to 1900 and arguably a long way beyond that. But because the terminology is new, businesses have tended to treat it as a new discipline and so have somehow accepted that they will have to fumble their way through it with little prior knowledge and few opportunities for current synergy. So am I serious about this? Should some businesses seriously just not do content marketing? Well, that's not quite what I'm saying. B2B content marketing has a place in your business's marketing mix. But much like everything else in life, there are effective ways of doing it and ineffective ways of doing it. More critically still, moving from the first state to the second often isn't just a question of improving the content itself. Instead, it's a question of challenging cultural, organisational and behavioural norms within both your team and others. 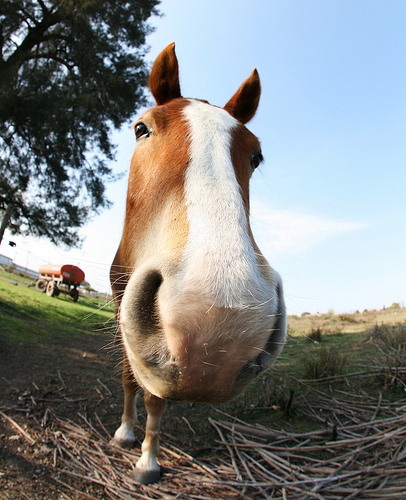 Your business's content can evolve into a true thoroughbred. Unfortunately, getting there requires dealing with some stubborn mules along the way.